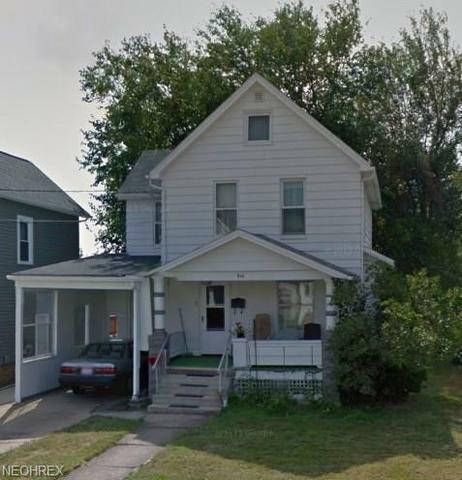 CLOSING TONIGHT STARTING AT 6:30 PM ONLINE ONLY BIDDING on this 3 BR, 1 BA, 2-story home with full basement and carport in Girard. Contents will be sold separately. This property is being sold at public auction to settle the Estate of Antoinette DeSteven, Trumbull Co. Probate Case # 2017 EST 1011, with timed, internet only bidding at BasingerAuctions.com. This is an older house with a large 15’x 12′ eat-in kitchen, with a large 16′ x 6′ pantry, a 11’x 10′ formal dining room, and a 13′ x 11 living room on the first floor. On the second floor there at 3 bedrooms, a 14’x 12′, a 12’x 8′ and a 11′ x 11′, plus a full bath with cast iron claw and ball foot tub and ceiling mounted show curtain rod. The full basement has several rooms including a wine/fruit cellar, storage room and laundry area. There is a gas forced air furnace with electronic air filter and there is a newer 40 gallon gas water heater. There are some newer windows, doors, and glass block windows installed in the house. There is a covered carport with a sheltered side door entrance to the house. The bidding will open at $5000 plus a 10% Buyers Premium, and will sell to the highest bidder in the timed auction on the listing brokers website, and closing on Tuesday, April 17 at 6:30pm. $ TERMS: 5,000 non-refundable down payment within 24 hours of the close of auction, balance at closing within 30 days. There will be a separate auction for the personal property with internet only bidding on the listing brokers website. All sales final! If high bidder fails to close within 30 days, they will lose their $5000. deposit. Guaranty/Warranty. All assets offered on Bid-Assets.com are offered AS IS, WHERE IS by the Seller. Seller and Bid-Assets make no warranty or guaranty of any kind, expressed or implied, as to fitness for any purpose of the property offered for sale. The Buyer is not entitled to any monetary damages for items purchased. Buyer will bid on items as if he/she has personally inspected it and is in no way relying on descriptions by Seller or Bid-Assets to influence their bidding. Injury/Damages. Anyone attending the preview or removal periods do so at their own risk. Attendees will hold harmless the Sellers, Bid-Assets, and their staff for any injury to those in their party or damage of goods purchased. Inspection. It is highly recommended that potential buyers inspect the items before bidding. Most assets offered for sale are used and may contain defects not immediately detectable. Items may be inspected only on the posted inspection dates and times. Dates and times may be found on the individual auction’s main page. Attendees agree to rectify and repay the Seller for any damages that the may occur to assets, or property on the site that the attendee may cause. Bid Cancellation. Bid-Assets and the Seller reserves the right to reject any and all bids and to remove from sale any of the items listed. All bids are final. Use extreme caution as buyers may NOT retract bids once confirmed through Bid-Assets. ERRANT BIDS. Buyer agrees to be liable for any and all bidding mistakes on the Bid-Assets platform. Should a major entry error occur, Buyer must notify Bid-Assets immediately by email at auctions@bid-assets.com and provide which auction, their buyer number, and the errant gross bid. There is a $10. FEE FOR FIXING EACH ERRANT BID and that fee will be charged to your credit card at the end of the auction. This is for EACH BID CHANGED! The buyer that registered to bid understands and hereby agrees that they are solely responsible for the bidding that takes place under their logged in device and agrees to pay this fee along with the items purchased under the registrant’s buyer number. Should the Registered Bidder be outbid, with no high bids, the Registered Bidder allows Bid-Assets to bill their credit card $10. for each incident of fixing the errant bids. If this happens during the auction closing, call Bid-Assets immediately at (330) 219-8855 so that the error can be fixed before the item closes. There is no guarantee that Bid-Assets can fix the errant bid before the item closes. Buyer agrees to pay for ALL items that they are the successful bidder on. Halting, Rescheduling, Canceling Auction. Although rare, the Seller or Bid-Assets may Halt, Reschedule, or Cancel an auction for any reason. Should an auction be halted, the Buyer agrees to be bound by their bid until the auction is completed. If an auction is re-scheduled, the Buyer agrees to be bound by their bid until the auction is completed. If an auction is canceled, Bid-Assets will cancel all bids, and the Buyer is released from their bidding contract. Auction Platform and Entry Errors. Users of this platform agree to hold harmless Bid-Assets, the Seller, and Third Party Sellers, for any and all errors due to mis-entered information, internet connectivity, server failure, date/time changes to any auction, and any errors that could result from the use of this bidding platform. Bid-Assets may halt an auction to make necessary changes. Bidding Process. Most auctions utilize a “soft close”. Starting at the close time of the auction, items will begin closing with a group of items each minute until all items are sold. Should recent bidding take place before an item closes, that item will extend up to 3 more minutes until there is no more bidding activity. Items will continue closing in order while the extended items remain open for bidding. Bid-Assets allows you to raise your own bid. If you are the high bidder and want to increase your maximum bid, DO NOT put anything in the first bidding box. Use the Max Bid Box only on the right! Invoices. Successful bidders will receive an invoice via the email that was used in registration, for all purchases, within 24 hours of the auction closing. Before the auction closes, Buyers MUST have a valid credit card on file that will absorb the charges for each auction. All payments are due via credit card at the closing of the auction unless specific arrangements have been made with Bid-Assets. No Exceptions. Buyers Premium. An additional 10% buyers premium will be charged to all purchases at the end of the auction, and will be shown on the invoice as an extra charge to the assets purchased. Payments. Payment in full will be charged to the credit card on file within 24 hours of the auction closing. If a buyer chooses to use Paypal instead of the credit card on file, Buyer must contact Bid-Assets in writing via email at: auctions@bid-assets.com, and must include the Name and Date of Auction, Buyer Number, and their EXACT Paypal email address. Invoices with tax and premium above $10,000. must be paid by certified funds within 48 hours of the auction closing. Certified Checks shall be made payable to: Bid-Assets and must be brought to the pickup site listed on the auction, or mailed to: Bid-Assets, 7250 Bishop Road, Poland, OH 44514. Bid-Assets will specify if check should be brought to site or mailed. Removal. Buyers agree to remove their purchases in accordance to the dates and times posted on the specific auction’s homepage unless otherwise notified in writing of a different date. No Exceptions. Buyer must bring a “Paid In Full” receipt to the site with their ID to receive their items. Buyer is responsible for loading and removal of any and all assets on their invoice. Buyer agrees to bring their own tools and assistance to remove any asset. The Buyer will make all arrangements and perform all work necessary, including packing, loading and transportation of their items. Under no circumstances will Bid-Assets staff or Seller assume responsibility for packing, loading or shipping. Items not retrieved by during the removal period will be considered forfeited without refund. Unpaid items that are left on site outside of the removal dates and times will incur a $20. per day fee per invoice. If a buyer purchases and pays for an item, and abandons it, Buyer will not be given a refund and agrees to pay Bid-Assets the removal cost plus 20%. Vehicle Titles. Bid-Assets will arrange the meeting between the buyer and seller to exchange and notarize any titled asset. Bid-Assets does not guarantee or warranty the title in any way. All arrangements regarding title must be performed directly with the Seller. Termination of Use. Any buyer that Bid-Assets or the Seller deems unfit to bid for any reason may result in termination of bidding privileges not limited to but including: (1) failure to abide by all terms and conditions set forth by Bid-Assets; (2) payment failure for any reason; and (3) failure to remove all items within the specified time listed on each auction. Buyer may not participate in any auction on the Bid-Assets online auction platform until the amount in default has been paid in full. The Seller may exercise legal action against the buyer for violation of terms agreed to in this contract. Buyer allows the Seller to reclaim and resell all items not removed in the agreed date and time without refund to buyer. Acceptance of Terms and Conditions. By placing a bid on Bid-Assets.com, the bidder agrees that they have read, fully understand and accept these Terms and Conditions, and agree to pay for and remove the assets, if the bid is accepted, by the dates and times specified. Credit Card Pre-Authorization: At each of our online auctions, once you place your first bid, Authorize.net will “pre-authorize” the credit card entered for $1.00 . (This is to authorize the card only…not a charge.) If the credit card account information entered does not pass this authorization, it will direct you to re-enter your card information and will allow 3 attempts before lock out. ALL bidders must register with a valid credit card in order to bid on our site. If you need assistance in updating your new credit card on file, please contact Bid-Assets. From St. Rt. 422 in Girard, go east on Rt. 304 (Churchill Road) to Washington Ave., then north to house on west side of road, or from Rt. 193 (Belmont Avenue) go west to Washington Avenue, then north to house on west side. Watch for AUCTION signs. CLICK HERE FOR FULL MLS DETAILS.